We know very little about this author, but a few clues in the text suggests that he worked at the University of Paris and the Cathedral of Notre Dame. Some scholars have suggested that he was a priest or canon, but it was unlikely that he was among the elite of the city. The Bourgeois de Paris has left us an account of the years 1405 to 1449, and it almost reads like a personal diary of what was happening in the city. It is a very detailed account, even noting the ups and downs of prices for food and goods. It is also a very sad tale, as it recalls the sufferings of Parisians as their city was caught up in the Hundred Years War (1337 – 1453), which pitted the King of France against the King of England. All that they found, of whatever rank, whether they had been taken prisoner by the soldiers or not, they hauled out into the streets and killed them at once without mercy, with heavy axes and other weapons. There was not a man there this day who had not got some weapon with which as he passed he struck at these confederates as they lay there stone dead. Women and children passing them, and weak people who could not hurt them, cursed them, saying, “Filthy traitors! You’ve had better luck than you deserve! If only the rest of you were in the same state!” There was not one of the principal streets of Paris that had not had a killing in it. In less time from the moment they fell dead than it would take to walk a hundred yards, there was nothing left on them but their pants. They were heaped up in piles in the mud like sides of bacon – a dreadful thing, it was. Five hundred and twenty-two men died by the sword or other weapons that day in Paris out in the streets, not counting those who were killed inside the houses. And it rained so hard that night that there was no unpleasant smell at all; their wounds were so thoroughly washed by the rain that in the morning there was nothing on them but congealed blood, no foul matter at all. 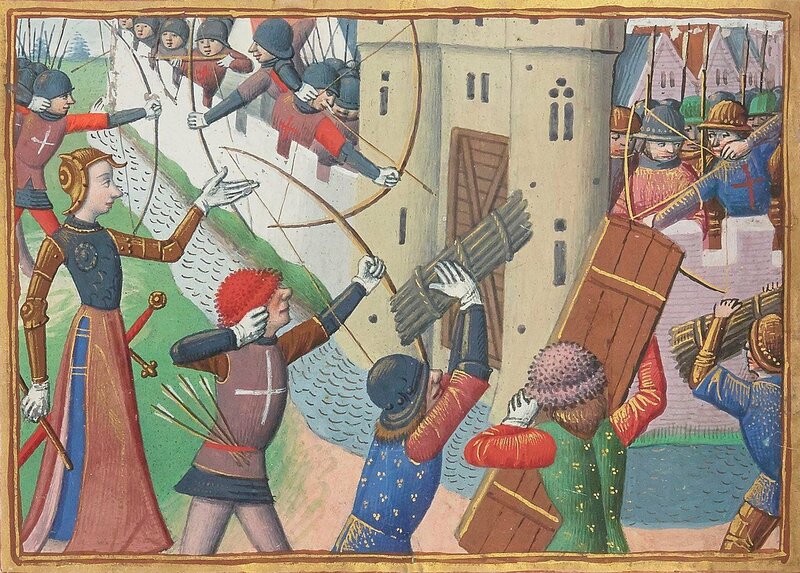 The English army marched into Paris in the year 1420, and for the next sixteen years the city was under their rule. The English had the support of the Duke of Burgundy, while the Armagnacs took the side of the French king. The Armagnacs also controlled large areas just outside of Paris, which meant the front lines of the conflict were now just on the city’s doorstep. The sufferings he recounts are terrible. The poor would starve because food was so scarce, and thousands of homes were abandoned and falling apart as their occupants had fled long ago. In the countryside around Paris few would travel or farm, for fear of being attacked by the Armagnacs or criminal gangs. Even wolves roamed in the area, so hungry that they would dig up corpses or jump up over the walls looking food. fifty or sixty or so carters from Paris and the neighbourhood went to fetch in the corn belonging to the citizens of Paris that had just been harvested near Bourget. The Armagnacs found this out from their spies, of whom they had any number in Paris, and came in strength to attack them. Our men from Paris defended themselves as well as they could, but it was no use, the Armagnacs defeated them almost at once, killed many of them, and took prisoner all the rest, and in their wickedness they set fire to the corn in the carts and wagons and burned everything; nothing was recovered but the ironwork. Any of mortally wounded (or less than mortally) lying on the ground they they saw move, they picked up and flung into the fire, which was enormous, all the corn and the carts were blazing. Besides the dead, they took six score or more prisoners and all the horses and ransomed them. Four blind men wearing armour and each carrying a club were put into an enclosure in which there was also a strong pig. This they were to have if they could kill it. They fought this very odd battle, giving each other tremendous blow with clubs – whenever they tried to get a good blow in at the pig, they would hit each other, so that if they had not been wearing armour they would have certainly have killed each other. On the Saturday before this Sunday the blind men were led through Paris wearing their armour, with a great banner in front of them with a picture of a pig on it. In front of this went a man beating a drum. There was at this time a Maid, as they called her, in the Loire country who claimed to be able to foretell the future and who used to say ‘Such a thing will certainly happen’. They hoped to take the city by assault, but little did they gain there except sorrow, suffering, and disgrace. Many of them were maimed for the rest of their lives, men who before the attack had been strong and healthy – but a fool will never believe anything till he’s tried it. I say this because of these men who were so unfortunate, so full of foolish trust, then they relied upon the advice of a creature in the form of a woman, whom they called the Maid. “Shall we, you bloody tart?” said a crossbowman, and shot at her. The bolt went right through her leg; she ran for safety; another transfixed her standard-bearer’s foot. When he felt the wound, he lifted his vizor to see to take it out and another man shot at him, hit him between the eyes and killed him. You can read the English translation of this account in A Parisian Journal, 1405-1449, by Janet Shirley, which was published by Clarendon Press in 1968.